People line up outside the Hard Rock Stadium to apply for D-SNAP benefits. The long lines in October prompted a lawsuit against the state agency responsible for handling the program. And before any of this, the federal government was worried Florida didn't have much of a plan. Listen to the full version of The Florida Roundup here. Sun Sentinel reporter Skyler Swisher and WLRN's Wilson Sayre are featured in the second segment, 20:28-40:18. 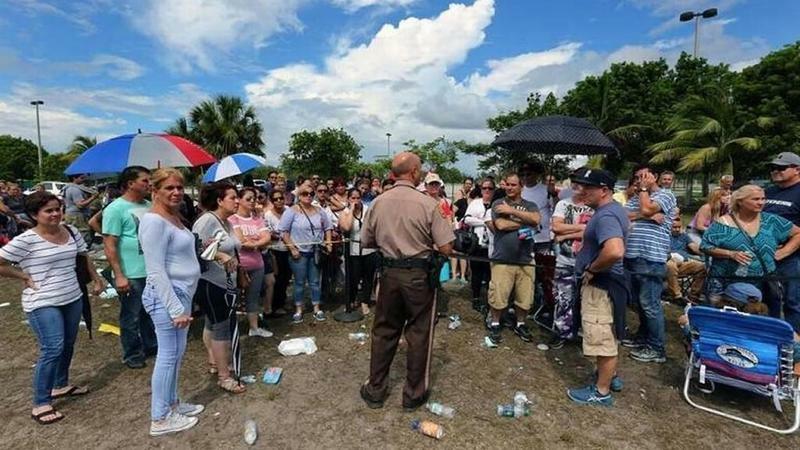 This time around, thousands showed up to the BB&T center in Sunrise and Hard Rock Stadium in Miami Gardens from Tuesday through Thursday to apply for assistance. WLRN: Wilson, you were at the Hard Rock this week? Sayre: Yes, I was out there yesterday for a couple of hours, and it seemed that most people were kind of surprised how short the lines were, given the accounts of five-, si-x, seven-, eight-hour-long lines for the make-up days and the original registration days in mid-October. So I think people were surprised that it was only two hours. Things seemed to be going pretty quickly. Everybody sort of knew where they were supposed to go and how it was going to work. That is very much in contrast to the original days in mid-October. Skyler, how about your experience at the BB&T center in Sunrise? Swisher: It seemed like it was running a little bit more smoothly than a few weeks ago. The lines were moving. There was a lot of traffic. It took a little while to get in and get parked. But once you got parked, from the people I talked to, you got through relatively quickly. Anywhere from half an hour to an hour and a half. What about the demand still for these benefits? Sayre: If you look at just the number for Wednesday, Miami-Dade processed almost 12,000 applications, Broward 17,000 applications. There’s a huge demand. There’s a growing awareness or questioning of whether the process to sign up for D-SNAP is appropriate; to force people to go in person to sign up for these benefits. In the original registration days, accommodations for people with disabilities were few and far between. In some locations it was better than others, but there are a lot of questions about that. Some of those questions get down to some of these folks qualifying for these benefits because of economic need. They lost power and food because of the storm. Perhaps an hourly or freelance job was taken away because of the power and now they’re being asked to go on a weekday to spend several hours in line to get these benefits. You were in court this week as the agency that distributes all this is trying to sort out some more 21st century methods of signing up. Sayre: The Miami Workers Center along with the University of Miami Health Right’s Clinic is representing several people who have documented disabilities who pre-registered and then were either not able to go out to a site and register or went out to a site and because of their disability couldn’t last so many hours. The question is, were there reasonable accommodations for people with disabilities? These in-person interviews are required by the federal government, although it’s a state-administered program. They say if you go in-person and have your ID there’s less likelihood that you’re going to lie or misrepresent your situation. But the argument is that’s unreasonable. 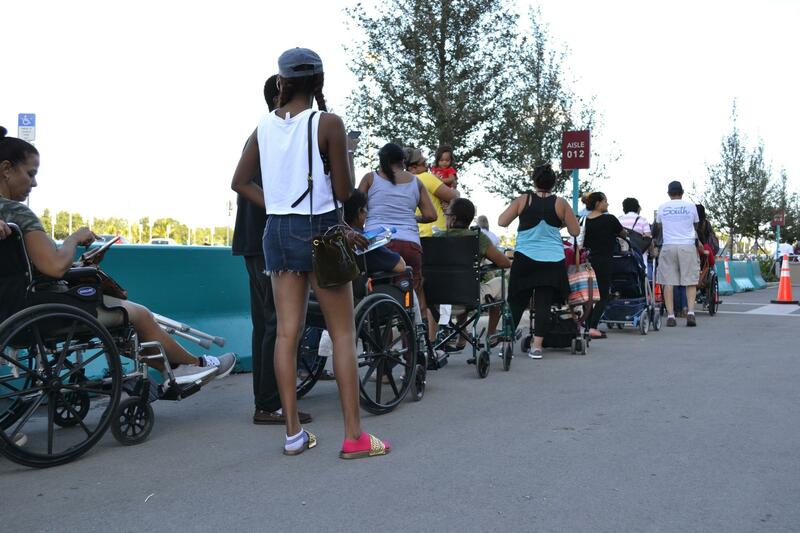 You can’t expect people to stay in line for seven hours when they’re in a wheelchair, have a walker or have various other disabilities. I saw one person wheeling around an oxygen container yesterday. There’s only so many hours that can last before you have to then get back in your car and either go plug in your oxygen machine or get another canister. So there was a tentative deal worked out. The federal government is going to decide whether or not it will offer telephone interviews for people who pre-registered. That’s actually a big deal because they’ve never offered telephone interviews in any D-SNAP in any other state that’s had this. They could say no, and at that point it will trigger another hearing and a federal judge will weigh in. The money used for these benefits comes from the federal government, but the feds have been concerned over Florida’s D-SNAP distribution system. Swisher: They had some early concerns. When Florida submitted their plan, it was four pages long. The federal government raised some questions and wanted to see more information about managing the crowds and providing security, water and restrooms. The state did amend its plan to 11 pages, which was approved by the federal government. Was the 11-page program the one instituted in October? Swisher: That was the request to operate the program for Hurricane Irma. There is a longer plan that’s on file with the USDA that’s about 111 pages. Is the process for D-SNAP applications and decisions over? Swisher: It appears so. There is that outstanding request that would allow people with disabilities and the elderly to do a phone interview in lieu of the in-person interview. But if you weren’t able to get in and get signed up, other than that I don’t see a way that you’d be able to get this benefit. Sayre: As part of the ongoing litigation, the sort of tentative agreement is that the possibility to sign up for D-SNAP will remain open for people who pre-registered and have a disability through the 20th, at which point there will be another hearing. If you did pre-register and you believe you fall into the category of having a disability, you still might have that option. Lines were moving much more quickly at Hard Rock Stadium at mid-day Thursday, the final day to register for disaster food assistance (D-SNAP) in Miami-Dade and Broward counties. After reaching capacity early Wednesday amid accounts of people passing out in the heat, the registration sites seemed to have finally gotten into the swing of things Thursday. Sweaty and eager to be done waiting in line, most were just happy to get the assistance they walked away with, ranging between $192 and $1,153. 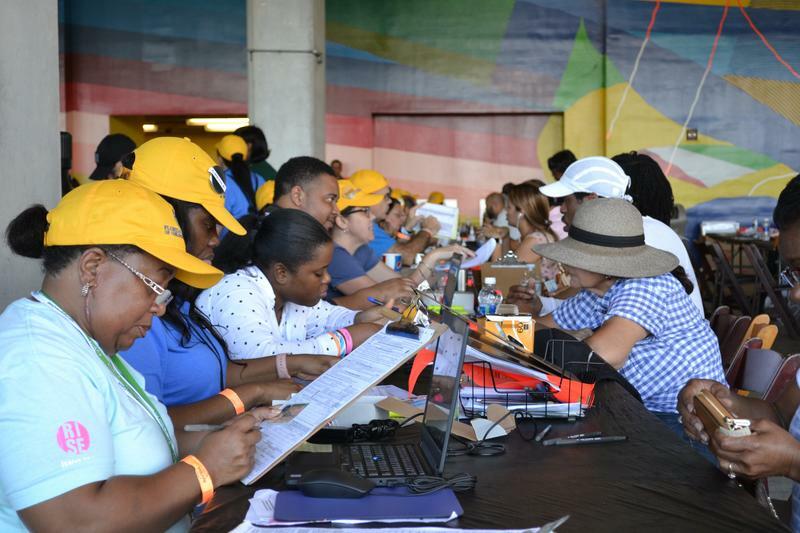 More than 38,000 families have registered at Hard Rock Stadium for the disaster food program since sign-ups started Tuesday, according to DCF. Today in Sundial: Tens of thousands of South Florida residents are still in need of food assistance more than a month after Hurricane Irma smashed through the region. 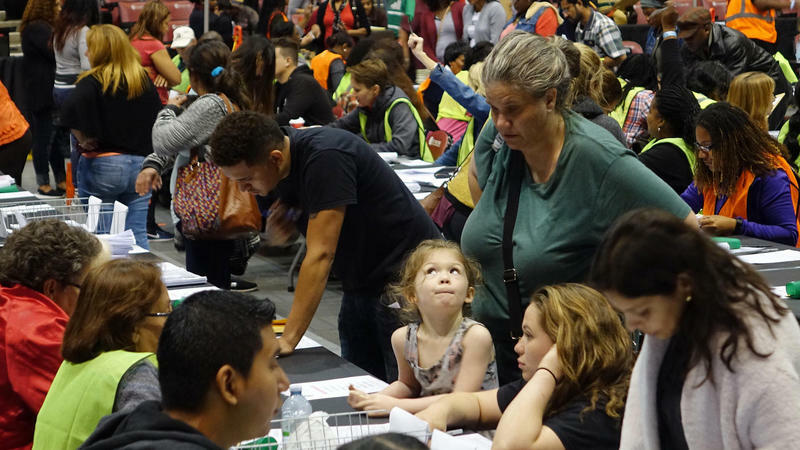 Recently, people waited in lines for hours to qualify for D-Snap, a federal program being facilitated by the Florida Department of Children and Families.